You are here: Home / Is faith the gift of God in Ephesians 2:8-9? Though many Calvinists use Ephesians 2:5 and Ephesians 2:8-9 to teach that “regeneration precedes faith” and “faith is a gift of God,” a careful examination of these texts reveals that they teach the opposite. The understanding of both texts builds upon what Paul wrote in Ephesians 2:1-3. If you do not recall how those verses are to be understood, you may want to go review that post before reading further in this one. [God] … even when we were dead in trespasses, made us alive together with Christ (by grace you have been saved) … (Ephesians 2:5). 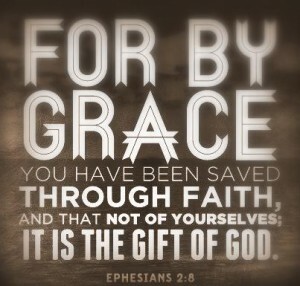 For by grace you have been saved through faith, and that not of yourselves, it is the gift of God, not of works, lest anyone should boast (Ephesians 2:8-9). To begin with, Ephesians 2:5 does seem to support the idea that regeneration precedes faith. After all, Paul has just explained that even though all of us were dead in our trespasses and sins (Ephesians 2:1, 5), and now he says that God, out of His great mercy and love, made us alive together with Christ. There is no mention here of faith in Jesus Christ, but only the grace of God. However, this is a classic example of a verse that, when taken out of contexts, sounds like it is teaching the opposite of what it really is. 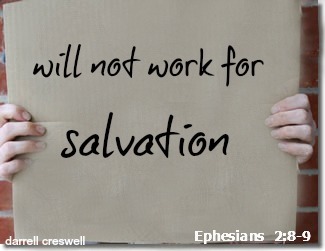 God’s activity in salvation is the theme of Ephesians 2:1-10. In this passage, Paul takes his readers from the depths of sin in Ephesians 2:1 to the heights of God’s righteous plan for our lives from before the foundations of the world in Ephesians 2:10. The “salvation” in this passage, by the way, fits the same definition we saw earlier in this series (see the definition of “saved”). Salvation in Ephesians 2:1-10 is not simply justification or receiving eternal life, but also includes sanctification (Ephesians 2:10) and glorification (Ephesians 2:6). So when Paul writes in Ephesians 2:5 about God raising us up in Christ, he is not stating everything there is to know about being raised up to new life, but is simply introducing a theme which he will explain further in the following verses. 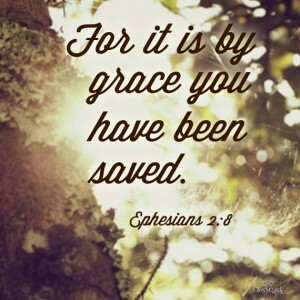 After a brief explanation about what this life in Christ, this “salvation” entails (Ephesians 2:6-7), Paul picks back up the “by grace you have been saved” statement in Ephesians 2:8-9 and explains it further. And what is it Paul says? He modifies what he wrote in Ephesians 2:5 by pointing out four additional things about this life which we received by the grace of God: He says this life is also (1) through faith, (2) is not of yourselves, (4) it is a gift of God, and (3) is not by works. This helps us see several beautiful things about Paul’s point. First, by clarifying as he has about how this life is received, Paul clearly puts faith prior to regeneration. By stating that we are “saved through faith,” Paul indicates that faith is a condition to receiving new life in Christ. Yes, there would be no life whatsoever without the grace of God, but in the same way, God does not force His life on others without them first believing in Jesus for it. Regeneration does not precede faith; faith precedes regeneration. Secondly, Paul is clearly contrasting faith and works, as he does elsewhere in his writings (cf. Rom 4:4-5). As seen above, Calvinists sometimes argue that faith would be meritorious if people could believe in Jesus for eternal life, and therefore, faith is a work. Paul does not agree. By contrasting faith with works, Paul shows that the life we receive from God is not by works, but it is by faith. If faith were a work—even if it was a work of God—Paul’s point would be reduced to gibberish for he would be saying that salvation is not by works but it is by the work of faith. When we allow the clear contrast between faith and works to stand, Paul’s points is clearly seen. Yes, we cannot in any way work to earn or merit eternal life in Christ. We can, however, believe in Jesus for eternal life. Faith is not a work, but it is the avenue by which we receive the life of Christ. Finally, the middle two items of the chiasm reveal that this salvation package from God did not originate with man, but with God. It is His gift to humanity. As can be seen through comparative religion, no human philosopher or religious leader has ever invented the idea that God fully and freely accepts human beings without any effort or work on their part. Instead, every human philosophy and religious system is filled with ideas about working our way back into the good graces of whatever deity is being worshipped, and about pleasing and appeasing the gods who are angry with us. It is about sacrifice, fear, and effort. But not so with the God revealed in Jesus Christ! He gives the salvation package–from sin and death and slavery to exaltation in the heavens (Ephesians 2:1-3, 6-7)—freely, by His grace, without any human works, effort, or sacrifice involved. No human could have dreamed this up, but God did, and God gave this revelation to us as a gift. This then leads us to understand what Paul is referring to when he says “it is the gift of God” in Ephesians 2:8. Again, many Calvinists look at this verse and notice that a few words earlier, Paul mentioned faith, and based on this, argues that “faith is the gift of God.” But this cannot be. In Greek, pronouns must agree with their antecedent in gender and number. English somewhat does this with pronouns like “he” and “she” but other pronouns like “they” and “it” are more difficult to determine. No so in Greek. All pronouns in Greek have gender and number, and they must always agree in gender and number to the noun they are pointing to, whether it is masculine, feminine, or neuter. In Ephesians 2:8-9, the word “that” (Gk., toutō) is neuter, but the word “faith” (Gk., pistis) is feminine. So also is “grace” (Gk., charis). In fact, if we keep looking for a neuter noun to which the pronoun “that” can refer, we will search in vain. There are neuter nouns in the context, but they make no sense as an antecedent. 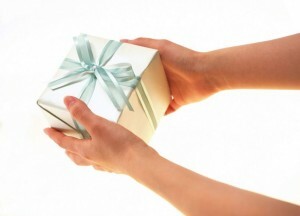 So when Paul says “and that … is the gift of God,” to what is he referring? There are five views on how to understand Paul’s statement. First, some just say that Ephesians 2:8 contains a grammar mistake or an exception to the rule. They argue that contextually, the word “that” refers to faith, regardless of the fact that this contradicts basic rules of Greek grammar. The second view is similar, but argues that instead of “faith,” the pronoun refers to “grace.” Again, those who hold this view must argue that the verse contains a grammatical mistake or an exception to the rule. Neither option is likely, since this sort of basic grammatical mistake is not found elsewhere in Scripture, nor is there any example of this “exception to the rule” being used elsewhere. The idea is that Paul specifically and intentionally changed the case of the pronoun to add force and emphasis to what he was writing about faith being a gift. However, in the twenty-two instances where the phrase “and that” is found, none of them change the gender for emphasis. This view seems to be a case of desperately reading one’s theology into a text in order to force it to say what you want. The fourth and fifth views are similar. Both views note that the neuter demonstrative pronoun “that” (Gk., toutō) can refer to a concept or phrase, rather than to a single word. Where it refers to a multi-word concept, the gender of the pronoun remains neuter, regardless of the gender of the antecedent (cf. Luke 3:20; 5:6; John 11:28; 18:38; 20:20; Acts 7:60; 1 Cor 7:37; Php 1:9, 28; Heb 6:3). Based on this observation, the fourth view is that the pronoun is referring to the entire “by grace you have been saved through faith” concept, and the fifth view is that the pronoun only refers to the concept which Paul has stated twice in the context, namely, “by grace you have been saved” (Ephesians 2:5, 8). It seems that one of these two final views is the best, but which? Those who argue for the first view are still able to say that faith is a gift of God to the unbeliever because it too is part of the package of “by grace you have been saved through faith” which was given by God. Of course, even if this fourth view is correct, it does not necessarily require faith itself to be a gift of God. If this fourth view is correct, Paul could simply be saying that the gift of God is the entire plan of salvation, which means that God decided before the foundation of the world to make salvation available by His grace and through human faith. Nevertheless, it seems best to adopt the fifth and final view, for it not only places emphasis on the conceptual phrase which Paul has stated twice, but it also takes notice of the chiastic structure which Paul uses to further explain the gift of God. As seen in the chiastic structure noted above, the parallel statements “not of yourselves … the gift of God” are not explaining “faith” but are explaining “by grace you have been saved” (See the excellent article by Rene Lopez called “Is Faith a Gift from God?“). In this case, we once again see that the salvation-by-grace package originated with God in eternity past, is received by human faith (not by works), and is not something that we dreamed up, but is a gift of God to all people. This seems to be the best way to understand Ephesians 2:8-9. In Ephesians 2, then, Paul is not teaching total depravity, total inability, that regeneration precedes faith, that faith is a work, or that faith is a gift. When properly understood in it’s historical, cultural, grammatical, and contextual contexts, Ephesians 2 is a chapter which does not defend the Calvinistic system of theology, but disproves it at every turn. Do you think this is corporate, talking about the human race, or individual? I have never heard that this is corporate. Interesting thought. Is there someone who teaches this that I see the arguments for it? I was raised evangelical where all the emphasis was on personal, individual salvation. I now am discovering a host of Jesus followers who see many things through a corporate lens. Caleb Miller is a pastor in CO who would probably discuss with you. He is on FB. Thanks Heather. I sometimes wonder if the authors were intentional about adding these chiastic structures or not, but they seem to be found all over the place. Thanks for these outstanding posts on Calvinism. Your arguments are well thought out and confirmed by Scripture. Thanks, Leslie. Some feel I am attacking Calvinists, but that is not my goal. I simply want to provide alternative explanations to popular Calvinistic passages. I agree with the overall thrust of your post, but I’m stuck on an issue of semantics. Jesus seems to say that faith is a work (John 6:29). What’s your take on that verse? Excellent point, Chuck. I will try to answer this next week. For now, I would point to John 6:28 where some Jewish people ask Jesus what God wants them to do. Jesus is answering their question, and basically says that the only thing they need to “do” is believe in Jesus. Anyway, I look forward to reading your full response! No, I wouldn’t say so. I am digesting food right now that I had for breakfast. It is something I am doing, but I don’t think anyone would define it as a work. My eyes are seeing, my heart is pumping. These things are done by me, but are not “works” that I can receive any credit or merit for in my attempt to be a living, healthy human being. Very diligent exposition, I would also add that another interesting article is The Gift of God by Roy L. Aldrich (Bibliotheca Sacra 122 – 1965), which is in line with the accurate exposition in your post. In Philippians 1:28, we have “kai touto” being used with a feminine antecedent, soterias. That doesn’t by any means mean we all of a sudden have to conclude that faith is the antecedent in Ephesians 2:8, but it’s not an impossibility and there are catalogued instances of such a construct outside the NT as well. Good stuff. Hey Jeremy, do you have any recommendations for online courses on learning how to read biblical greek?